Summer’s not fun without adventure. And that’s how my summer is anyway, I just got to sulk with it. LOL. I wish something excited happened this summer. All I ever heard from everyone around me are money problems, family issues, that they’re tired. I’m sick of it! 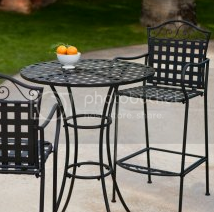 I wish I could at least relax somewhere with these outdoor bistro sets from BistroSets.com because I need to relax. No one really asks how I feel at all. Fine, they do but I think they’re asking for the sake of asking. Actually I think we all here at home need to relax. Meh. Hopefully, one of these days you know?